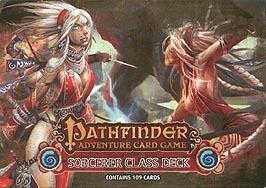 Chaos and order battle for supremacy in the Pathfinder Adventure Card Game Sorcerer Deck!. Explore four different Sorcerer archetypes in this 109-card set, from master mesmerist Qualzar to tattooed mystic Seoni. The Sorcerer Deck is chock full of new spells, allies and other loot to take your character all the way through any Pathfinder Adventure Card Game Base Set, or Pathfinder Society Adventure Guild Organized play campaign! Blast on!